Is Instagram damaging your body image? Many of us are guilty of spending too much time on social media, and chances are you’ve felt drained after a long Instagram scrolling sesh. You know the ones — where it seems like everyone is on the Amalfi Coast sporting the body of a Victoria’s Secret model, while you’re horizontal trying to summon the willpower to start your work day. Often, it’s enough to make you pause, and feel your own life is a little lacking. If this sounds familiar, you’re not alone. According to a recent study, Instagram was found to be the most detrimental to its users’ mental health and body image. Published by the United Kingdom’s Royal Society for Public Health, the study surveyed 1,500 British teens and young adults on how different social media platforms impacted their mental and physical health, and found that Instagram left young users with high levels of anxiety, depression, bullying and FoMO (“fear of missing out”). Loren Byford is a Melbourne-based Psychologist with Scope Psychology who provides intervention and support specialising in children, youth and young adults. She says that what we see on social media is often, “images of celebrities who have invested excessive time and money into their appearance and body shape, and have resources that average individuals do not realistically have to invest in their appearance. However, she says, social media can also be a tool for good when it comes to body image. And there are some simple ways you can make over your socials so they don't leave you feeling down, and even remind you how fabulous you are! 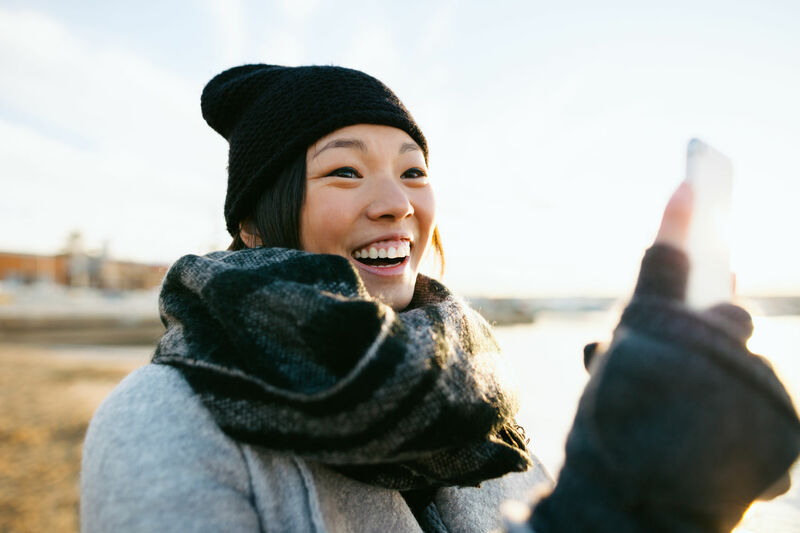 Even though social media can have negative effects on your body images, it’s also contributed to the conversation around representation of all shapes, sizes and ethnicities. For every #iwokeuplikethis selfie and perfect bikini body pic, there are more and more body positive accounts urging their followers to cop out of trying to fake a flawless life on social media, and love what they see in the mirror everyday instead. And they’re doing it by sharing pics (with their cellulite, acne, stretchmarks and disabilities on full display), using Instagram hashtags like #bodypositive and #bodyacceptance to ignite a global body positive movement. “There are opportunities for users of social media to feel encouraged and supported by the messaging and images that are viewed on social media. The internet can be a tool to increase feelings of confidence and self-worth if accounts [you follow] are carefully selected,” says Loren. A large number of social media accounts send the wrong message to their followers, posting only the most flawless of selfies and pics that make them seem like they have the “perfect life”. But, as many online positivity warriors demonstrate, if being on social media is making you feel bad about yourself, you might be following the wrong accounts. Sometimes un-following your favorite clothing brands is a tough one (even if they only post pictures of ridiculously good-looking people). If avoiding the content is not practical, understanding what’s behind that perfect image can help. “Spending time reflecting on how the image was produced can reduce negative feelings about your own body, for example, certain filters or photo shopping may have been applied, or maybe the image was taken at a certain angle that hides the natural curves and wrinkles of the human body,” Loren says. Having some clear boundaries about when and how often you use social media helps to keep it positive. Loren suggests things like having clear times of day where you don’t use social media, like late in the evening or if you’re feeling down. “When we are tired, or simply having a bad day, we are more prone to negative influences, as our capacity to respond constructively is reduced. Having your own clear personal boundaries regarding social media use can be protective,” she says. MORE: Swiped out: Are dating apps hurting your mental health? Ready to give your Instagram a makeover? We’ve made a list of Instagram accounts that have made it their mission to spread the body positivity message and promote a healthier conversation online*. @bodyimagemovement. Taryn Brumfitt is the Aussie powerhouse behind The Body Image Movement, which aims to teach women the value of loving their bodies, inside and out! Her feed is chockablock with feel-good vibes, as well as thought-provoking insights. @notoriouslydapper. The body positive movement isn’t just for women -- men are also struggling with growing pressures on what a man “should look like”. Luckily, bloggers like Kelvin Davis are spreading the body positivity message. Definitely #mancrushmonday material. @celestebarber. With over 4 million Instagram followers, Aussie comedian Celeste Barber hilariously recreates celebrities’ most staged Instagram photos to reflect real lives and “real bodies”. If you’re looking for a side of humour along with your daily dose of body positivity, this is the account for you. @emmylou_loves. Emmylou is beloved by her followers for her infectious confidence and uplifting words of wisdom. She once paraded down Bourke St Melbourne in a swimsuit, which should be reason enough to click ‘follow’. @mamacaxx. Lifestyle and beauty blogger Mama Cax was given 3 weeks to live at age 14 after being diagnosed with cancer. Thankfully she beat the odds and survived - but not without the loss of her leg. Today, she inspires thousands with her positive approach to life, body image and self-love. @positivebodyimage. Run by twin Canadian girls, with a mission to spread body positive inspiration to anyone who needs it! They repost the best #bodypositive content from all over Instagram, so treat their account as a kind of one stop shop for feel good vibes. @healthyisthenewskinny. Sick of seeing unhealthy and unrealistic messages on Instagram, husband and wife duo Bradford and Katie Willcox started Healthy is The New Skinny to help change the conversation around what #fitspo looks like. @thisgirlcanvic. Want some #fitspo that actually makes you feel good about yourself? This Girl Can is a Victorian campaign that encourages women of all shapes, sizes and abilities to get up and get active. Through being more selective and mindful of who you follow on Instagram — those who celebrate and promote a diversity of body types — your feed can be a great platform to boost your confidence and maybe even inspire you to share the good vibes on your own profile! If you need help or support for an eating disorder or body image issue, please call the Butterfly Foundation 1800 334 673 or e-mail support@thebutterflyfoundation.org.au. *Medibank does not hold any financial or in-kind agreements with the Instagram accounts listed in this article. The content posted on these accounts is generated by the account owners and is not endorsed by Medibank.